Spartanburg County District 6 serves the areas of Moore, Pauline, Roebuck, and Spartanburg. Although mostly residential, the area has seen a recent rise in commercial development making District 6 one of the fastest growing areas in Spartanburg County. Being one of the bigger districts in Spartanburg County, District 6 has many amenities residents can take advantage of. District 6 provides luxuries similar to that of a bigger city while also being extremely family friendly. Westgate Mall is a centerpiece in entertainment in the area, allowing residents to enjoy its many stores and services while also being just up the road from many fine restaurants and establishments in the area. Whether it's spending a Friday night watching the Dorman High School football team in its beautiful stadium, enjoying a round of golf at River Falls or just casually strolling around the mall, District 6 will continue to offer family-friendly activities in the years ahead. Spartanburg Country School District 6 consists of nine elementary schools, three middle schools, one ninth grade school and Dorman High School. District 6 schools prides themselves in putting children first, and in doing so provide the highest qualified staff, challenging curriculums, and first class facilities that ensure the optimal learning environment for children and high schoolers alike. Having been one of the first districts in South Carolina to have all schools accredited by the Southern Association of Colleges and Schools, residents of District 6 can rest assured that their children will be provided with a not only one of the highest quality educations in the county, but the state as well. 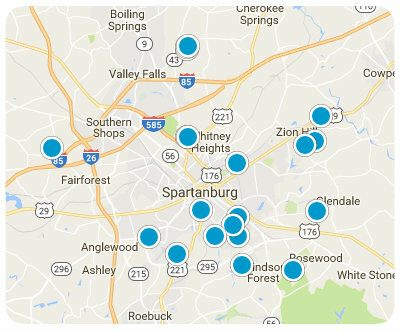 Due to its location and excellent educational opportunities, District 6 finds itself as one of the more desirable places to live in Spartanburg County. Mostly residential, District 6 offers a wide range of real estate options, everything from leisure type golf and gated communities to retirement townhouse communities. No matter what your lifestyle, District 6 has affordable real estate to fit your needs. If you see a home for sale in District 6 that you would like to tour, please give us a call!